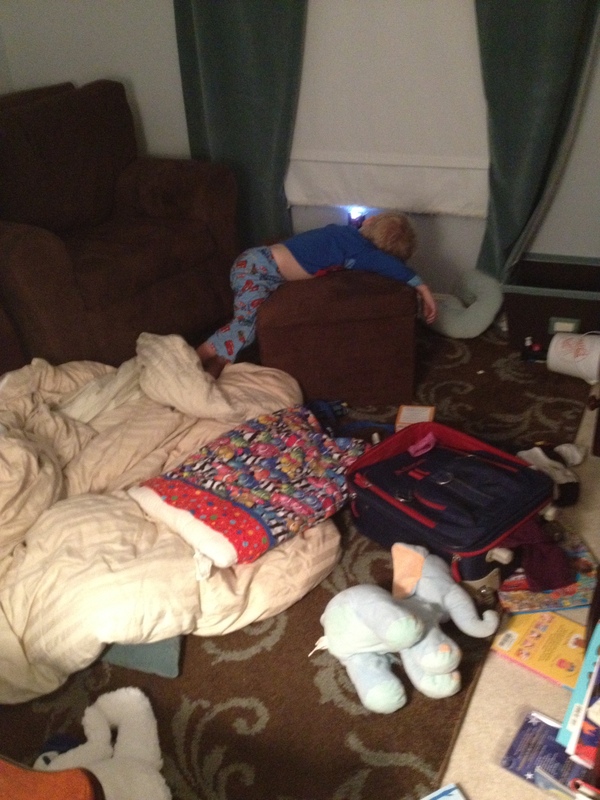 Yes that would be my three-year-old passed out on his ottoman in the bedroom he trashed in the dark. So where were you, Mamma, while your sweet boy was running around his bedroom, tearing the place apart? Oh, just reading a romance novel, and by romance novel I mean the really dirty kind. Where was your husband, you might add? Watching football. Questionable Choices in Parenting–man this blog can write itself in this house! Will my nightly check-ins of the boy become sort of a Where’s Waldo? If so, this could be a new section of the blog (until it isn’t funny and sorta annoying). So tell me, where is the strangest place you have found your kids sleeping? This seriously made me laugh out loud. I love this. I wish I had a video of the minutes before he just collapsed from exhaustion. Crazy kid! One night we breezed through the kids’ room to do the Nightly Good Parent Check. The Artist? Sacked out in the bottom bunk in her room with about eleventy zillion stuffed animals. The Professor? Sprawled diagonally across her bed, passed out cold. The Ambassador? The Ambassador? UH…..have you seen him? Nope. You? Nope. Not in any of the bathrooms, not sleeping on either of the dogs (been known to happen), not in the playroom…the hell? Fifteen FRANTIC minutes later, we found him. He was curled up in the Professor’s papasan chair, under her collection of fleece blankets and a massive stuffed rabbit. My just turned 4 year old son sneaks into our bed..or should I say mine because my husband seems to fall asleep on the couch almost every night, and so last night I slept with a foot wedged between my ribs and the night before it was an elbow to the cheek bone..and then the jugular. Apparently my son wrestles alligators in his sleep. Don’t we wish we could sleep like that!? Anywhere..everywhere and soundly..